in traffic, will ride out alone or in company, will lead or follow. Has been hauled to events and away trail rides, and is great in new places. He has an adorable puppy dog personality. Excellent ground manners, no bad habits or vices, easy to catch, lead, load, haul, stands tied anywhere, easy to clip, bathe, groom, pick feet, saddle, bridle, and stands well for the vet and for the farrier. 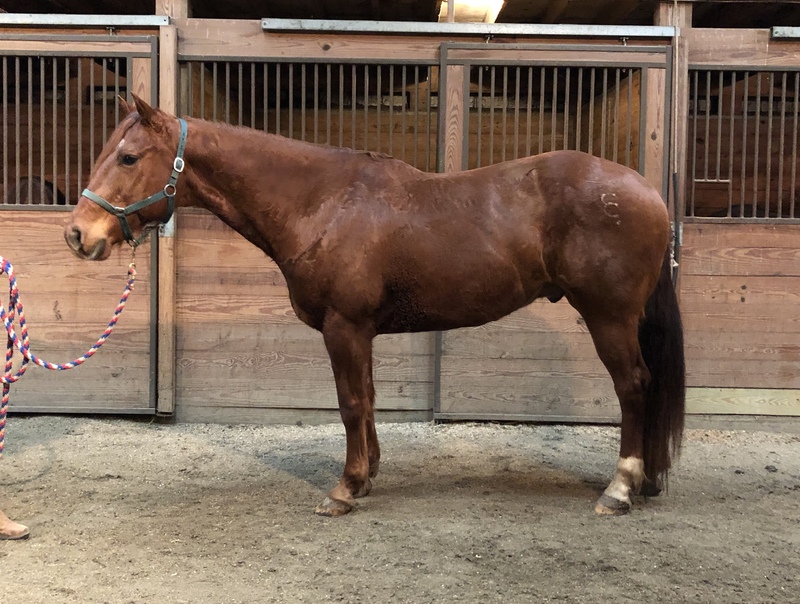 8 Red/White Pinto Gelding, 11yo, 16.0 hands, Hunter, W/T/C Jumps, has both leads has a big soft eye and a wonderful, in your pocket personality! He is a steady Eddie personality, so forgiving and fancy to boot!! He has a super disposition and is as gentle as can be. He has great ground manners, easy to catch, lead, load, hauls, stands tied anywhere, easy to clip, bathe, groom, pick feet, saddle, bridle, stands for mount and dismount and is good for the vet and the farrier. Loads in the trailer well and is quiet in new places. Don't miss this quality gelding! 3 Reg. Paint Palomino Gelding, 7yo, 15.2 hands, English/Western/Family horse, well rounded gelding that trail rides and you can take him to a show. He is an easy and uncomplicated to ride. He is a wonderful trail riding horse; super quiet and happy to ride along on a loose rein. His gaits are easy to sit, and he is super smooth. He has a nice stop, will pick up either lead, pivots on the hindquarters, backs. He has excellent ground manners, clips, easy to bathe, groom, catch, lead, load, haul, stands tied well, easy to pick feet, saddle, bridle, stands for mount and dismount, and quiet for the vet and the farrier. 39 Bay TB X QH Gelding, 12yo, 16.2 hands, Has been shown in Western Pleasure, Western Horsemanship, English Equitation and English Pleasure. He is also highly competive in Showmanship at Halter. He has excellent ground manners, is quiet around others in the barn, pasture, riding in a group, and standing tied. He is easy to catch, lead, load, haul, clip, bathe, groom, pick feet, saddle, bridle, great for the vet and farrier, and stands for mount and dismount. (860) 653-3275 | 30 Sakrison Road, Granby, Connecticut 06035 | We Are Open Daily by appointment only.